How did Second Life Start? It started with a dream. An idea. A passion for wanting to help homeless pets. I didn’t grow up with a dream to open a thrift store. In fact, I was so embarrassed to be seen in them as a teenager that my mom laughs about me starting one! Everything changed when we got married and bought a house. It was then we realized how expensive it was to buy retail. It was also when I realized how much fun I had searching thrift stores for unique treasures at bargain prices! 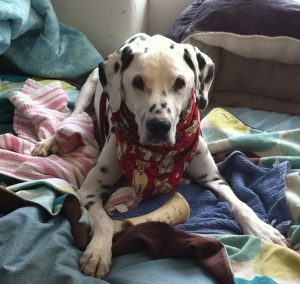 Lucky, our rescued Dalmatian joined our family in 2001 and became the love of our lives. He opened our eyes to the plight of homeless dogs and cats and we started volunteering with animal rescue groups. Animals truly change lives, and Lucky put us on a trajectory that we didn’t quite know about yet…and found many years later. I believe timing is such a big part of life. The inspiration came while visiting my hometown for a high school reunion. I had left the corporate world and was a little lost. It was a time for evaluating what I wanted to do with my life. I knew I wanted to start my own business, and I knew helping animals was a big part. The idea of combining these two loves didn’t occur to me until that serendipitous day. Opening Day in 2011. A lot has changed! 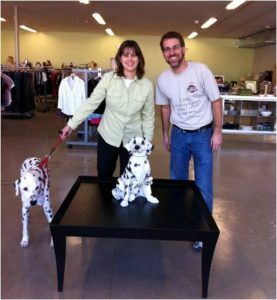 My husband, Toby is my biggest champion and he enthusiastically supported me when I told him I’d found my calling and wanted to open a thrift store to benefit animal rescues. I often wonder what I’d be doing today if I hadn’t walked into this store on that fateful day in 2009. Would I still be in the corporate world? Would I be as happy? Would someone else have filled the need for helping animal rescues? In 2011, Second Life was opened with the belief that we could make a difference for animals. There was a lot we didn’t know about starting our own non-profit organization. We are still learning, but it has been quite a journey, made possible by all of the support we have received from our friends, family, community…and animal lovers. A big thank you to everyone who believed in our dream and is helping us achieve it! With sincere thanks, Tanya!